A few weeks ago, 1Sky activists joined in the South Florida "King Mango Strut" with allies from across the state to bring attention to the BP Oil spill and shed light on the importance of clean energy. The day was packed with fun, theatrics and education. Every year on the Sunday following Christmas Day, South Floridians gather in the heart of Coconut Grove to celebrate the parade known as the King Mango Strut. The strut is a wacky, satirical, no-holds bar parade that showcases the year’s most controversial stories in a fun, lighthearted manner. Months of preparation and anticipation go into each performance, creating an almost theater-like quality to the parade. 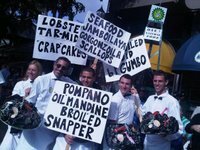 Among the top stories showcased in 2010 were the Chilean miners, New York bedbugs, and, of course, the BP oil disaster... 1Sky Florida activist joined thirty-six Sierra Club members as the club opened “The Sierra Club B.P. Cafe”, where cooks, waiters and waitresses in full garb served the public large trays of delicious seafood dishes from the Gulf, all covered in an appetizing black gook."